Hey everyone, Charlie James here. Thanks for watching ABC News. Now, most city’s have a food that they’re famous for. Here in Philadelphia, it is the cheesesteak. I’m outside of Geno’s, and it is one of, if not, the top cheesesteak restaurant in all of Philadelphia. But it’s also the site of one of the most famous rivalries as well, because Geno’s is here, and then literally just across the street is Pat’s: King of Steaks, who also considers itself the favorite. Both of these places are open 24/7 and are extremely popular – you can see the line out here and ever since I got here there’s been a line stretching around. Now, everyone orders and eats outside here at Geno’s, but we are going to go inside and talk to Geno Vento himself, the owner. His father is the one who actually started this restaurant, and he’s going to show us how they are made, tell us what the secret is, and we are going to get a little taste of this Philadelphia specialty. Here he is right now. Geno, the Geno. GENO: Hi guys! CHARLIE: So I imagine it’s been incredibly busy. GENO: Unbelievable. It’s been nonstop. CHARLIE: With the DNC in town, I imagine it’s even crazier. GENO: As you can see, the line is all the way across the street. CHARLIE: Took a look at that before we headed in. So, to start off, most places have a famous food, but this is more than food. What is it about the cheesesteak that kind of encompasses what the city is about? GENO: Well, first of all, it’s an iconic sandwich. Anywhere, all over the world, if you say cheesesteak they say Philly or if you say Philly, they say what’s your cheesesteak place. It goes hand-in-hand, and we started in 1966. CHARLIE: Coming up on 50 years? GENO: Yeah. 50 years in September. CHARLIE: Congrats. That’s huge. GENO: And here’s the actual first Geno’s. Geno’s in 1966. CHARLIE: And there’s a huge wall of famous people, politicians come here. GENO: Yeah a few have stopped by over the years. We just had Carson Daly here. CHARLIE: Yeah. He was just here before we left – or before we got started. So let’s take a look for those people who aren’t familiar with the cheesesteak. GENO: Yeah. Sure. Let’s go over to the grill. CHARLIE: We will see what it’s all about, and the right and wrong ways to order one. GENO: This is the man grill, and we have wiz, American, and provolone cheese. We start with thinly sliced rib-eye meat, and we are going to cook it on one side until it starts browning, and then we flip it over. Then, we make our piles, and our grill guy actually makes the sandwich. We put about six or seven slices, about six and a half ounces, and you get your choice of wiz, American, or provolone cheese, and guess what! Wiz is the iconic cheesesteak so that’s what you have to go with. And hopefully you like onions because a wiz with is the real seal of the deal, and then you have a choice of sodas: Pepsi, Coke, Birch is the Philly favorite, and also Arizona iced teas. CHARLIE: And so wiz is the classic? GENO: Clearly. Hands down. Wiz is the iconic thing. CHARLIE: And what are some of the other combinations though? Sometimes we see politicians come in here… GENO: Mushrooms, peppers, lettuce, and tomato. Sometimes we have a Milano, which is an old-fashioned pizza steak, but really the true classic Philly cheesesteak is the wiz with. CHARLIE: So tell us about you get a lot of famous people in here on the political trail. Geno’s is a must-stop. You got to eat a cheesesteak, but some politicians have gotten heat for ordering it the wrong way. I think most famously John Kerry, correct? GENO: Yeah. He wanted Swiss, and I’m like ‘No. That’s sacrilegious. You don’t order Swiss – it’s wiz. Or maybe he was a little tongue-tied, and he meant Swiss but he said wiz. I don’t know. CHARLIE: And so the people who come in here – is it a lot of tourists, a lot of locals, and what are they mostly ordering? GENO: I’m very lucky. We get a lot of tourists and a lot of locals. We’re a tourist destination, and basically, you get people from all walks of life, from janitors all the way up to presidents waiting in line for a cheesesteak. Can you imagine that? CHARLIE: Let’s learn a little more about how it’s made. This is a giant pile of onions here. GENO: Yeah. That’s how much we will be going through in the next half hour. CHARLIE: How much steak do you go through everyday? GENO: A lot. CHARLIE: So here’s the meat. GENO: Yeah. This is the beginning product. As you can see, we are flipping the meat over and everything. And I can show you the cheeses. Here’s the famous cheese wiz. This is what everybody goes crazy for. CHARLIE: And what’s this – I see you have other options. GENO: Yeah. We have American and provolone cheese. CHARLIE: For if you’re freaked out by the cheese wiz for any reason. So tell us a little about the story here at Geno’s. GENO: Well my dad started in 1966 and started with $6 to his name and borrowed $2,000 off my grandfather and turned it into a multi-million dollar business that you see today only with a ninth grade education. CHARLIE: So let’s talk about the name. GENO: I was named after the place. Everyone thought the place was named after me. I was named after the place. Back in the day, there was a Jim’s Steaks and a Joe’s Steaks and believe it or not, there was a Gino’s Hamburgers, and they had G-I-N-O. On the wall in South Philly, they had Gino’s, so dad said ‘You know what. Let me change the I to an E and be different to stand out from everyone else, and we called it Geno’s. So technically, I’m named after a wall. CHARLIE: But you seem OK with that. GENO: At first, I was a little ‘Oh, dad. Why’d you name it that? Everyone teases me.’ Now, Geno’s name opens up a lot of doors. CHARLIE: Now, when we were walking over here, we saw Pat’s across the street. Can you tell us a little more about how that rivalry started? Is it really a rivalry? GENO: It’s not really a rivalry. We are actually friends. Come over here, I’ll show you something. We actually live in the same building. Here’s us altogether. There’s Pat’s Steaks, Tony Luke, and me altogether. CHARLIE: So it’s not as heated as the media makes it seem. GENO: No. They say we are arch enemies, and we don’t get along. But we had dinner last week. We’re always hanging out. He’s a good friend. We grew up together. CHARLIE: It’s super fun in here, too. Here’s a portrait of you. GENO: Yeah. You never know who’s going to come in and who’s going to be here. CHARLIE: Is this the VIP table? GENO: This is the celebrity table. This is where all the celebrities sit, and they get to enjoy their cheesesteaks and have their privacy. We have this famous step-and-repeat where they can tweet and Instagram and Facebook all their pictures. CHARLIE: Are you guys doing anything special for the 50th anniversary? You bringing back any new products or anything like that? GENO: We are probably going to have a vintage shirt. We came out with a new 50th anniversary logo, so you’ll have to come by and stay tuned. It’s really cool. Something different, but kind of iconic. We are having a block party. We are having lots of celebrities coming in, and we are having entertainment acts. Most of all, we are going to be giving back to the community, so we are going to have some celebrities taking pictures behind the drop to raise money, and I’m going to be donating it to the charities of Philadelphia. CHARLIE: Nice. Before we talk to some customers, I’d like to kind of step-by-step through one of the sandwiches. GENO: Want me to make you one? CHARLIE: Yeah. That’d be great. Wow. 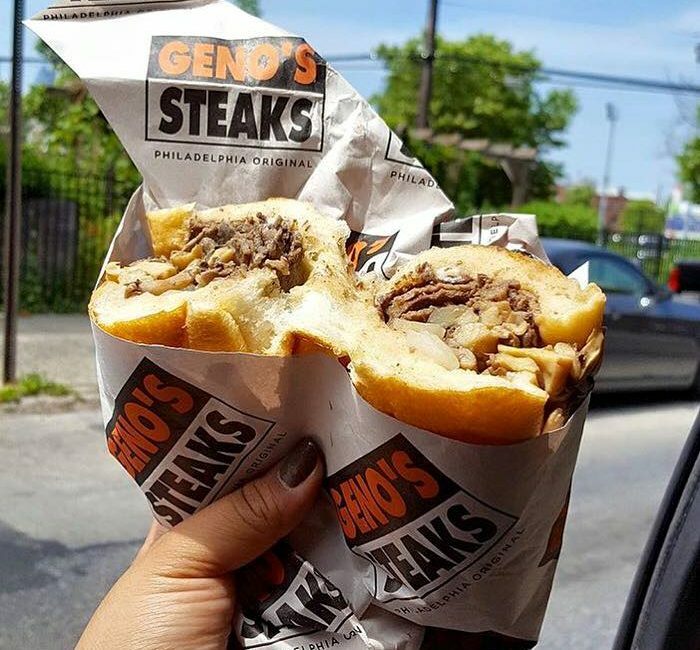 A Geno’s Steak made by Geno himself. This is a once in a lifetime thing. Where’s the bread come from? GENO: Liscio’s. It’s in Jersey. What I’m going to do is make you a classic wiz with onions. CHARLIE: A wiz with. GENO: Yes. And what I’m going to do is use the thinly sliced rib-eye meat, and I’m going to lay it in the meat like a deck of cards. Now I’m going to put some onions on, and that’s your classic Philly cheesesteak. CHARLIE: Wrapped in the classic Geno’s paper. CHARLIE: I wanted to talk to you about the ordering process. 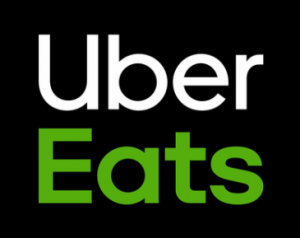 If you read reviews, people talk a lot about how the actual process of ordering is very important, and you can immediately tell if someone is local or not. GENO: Yeah. You have people come in and go ‘This is my first time ordering. What do I get?’ or ‘Hey. This is my first time ordering. What’s the main sandwich?’ I always tell people it’s wiz with. We have also American and provolone, but the true staple and claim to fame is wiz with. There’s people coming up and getting nervous and everything, but we work with you and calm your nerves down. People get so worked up like ‘How do I order? What do I do?’ but pick a cheese and tell me if you want onions. It’s that simple. CHARLIE: It’s that simple, but there are people who have made faux pas. Governor Scott Walker came through this last cycle, and he got a lot of heat in the press for a few things that he did. One was he skipped the line, which is apparently a huge faux pas, even if you are someone with a very packed schedule, like a politician. He ordered it with American cheese, which is another no-no apparently. And then he didn’t clear his own trash when he left. GENO: Yeah. He got pulled away from people. CHARLIE: So everyone sits outside and eats here, and there are a lot of pictures of his half eaten sandwich left there and not clearing his own plate. So it’s very important, politicians, to get it right because there are people on Twitter saying to get this guy out of Philadelphia before someone comes after him. GENO: But seriously, it’s no pressure. You just come here and tell us what kind of cheese you want, and we’ll take it from there. Trust me, you’ll have a great experience and a great tasting cheesesteak. CHARLIE: Everyone looks really happy here, so definitely don’t be scared. So I’m going to go ask some people about their experience here. Hopefully, there are some delegates out here that’d be great. Oh, I wanted to ask, too. Neither Trump nor Clinton has eaten a cheesesteak in Philadelphia. GENO: Not recently. But Bill Clinton, back when he was running as president, he did come here a few times. CHARLIE: But Hillary so far, Hillary has not. GENO: The day is still young. She has to eat sometime. CHARLIE: Yeah. She’s coming to Philly soon, so open invitation, I’m sure, for her to come here and finally enjoy one – Trump as well. I don’t know how long it’s been – we should get our ABC fact checkers on this – since one of the major candidates hasn’t eaten a cheesesteak, but Pennsylvania is a swing state, so this is important. Geno, thank you so much for participating in this live stream. GENO: Thanks for having me. Have a great day! CHARLIE: You can find him on Facebook. And we are going to go talk to some people. Don’t let the comments scare you. Everyone is super nice here, and there’s no problem with the ordering. So I’m going to step outside and talk with a couple people out here. It is the lunch rush, so it’s very business. Lots of people sitting here enjoying their steaks out here. It is very hot, but that has not kept people away. Geno’s has been extremely busy this week, because not only are there a lot of people in town, there are a lot of media. I’ll show you the ordering. It is cash only, and it is open 24/7, so if you want a cheesesteak at 2 a.m., you can get one. CHARLIE: So let’s talk to some customers here at Geno’s. This is their first time here. Are you guys here for the convention or work? PERSON: The convention and work. CHARLIE: Cool. Are you guys delegates? PERSON: We are working the convention. CHARLIE: And you had to obviously come by and have a cheesesteak. PERSON: We got Pat’s and Geno’s. CHARLIE: Oh you did? You’ve got both here. Alright. I’m sure a lot of people do that actually. Can you give us your experience? What’d you think? PERSON: We want to come back to Philly and eat more of them. I’m glad I don’t live here because I’d eat these everyday. CHARLIE: Well there’s a lot of places to have a cheesesteak here. There’s like 30 something shops. But he’s obviously the classic. PERSON: We did Jim’s the other night. CHARLIE: Maybe you guys can get like 10 stamps. PERSON: We are working on it. We are really trying. This is our fourth one in three days. CHARLIE: I’m going to take a picture of the two together if that’s alright. Do you guys have favorites? PERSON: Pat’s fries win for sure. It kind of a split between the sandwich. I like both. She’s Pat’s. He’s Geno’s. I like both. CHARLIE: You guys are comparing the classics, right? PERSON: Just wiz and onions. Comparing apples to apples. CHARLIE: Well enjoy guys. Enjoy the convention. So a few people here in town for the convention of course had to stop at Geno’s. It’s a must stop in Philadelphia. Thanks for joining me and we took you inside here – showed you how it’s made, talked to Geno. Make sure you stop by if you come to Philadelphia. And we will see in the next few months if Hillary Clinton or Donald Trump make it here because it’s hard to win Pennsylvania without tasting the iconic food.